For a majority of my life, I had never been a “Process” guy except when it came to work. I always believed order was meant for the military. I wanted to be a free bird – doing things my way at the time of my choosing. do not misuse time or take it for granted. your mind is your best friend and your worst enemy. the ideal world does not exist. You cannot achieve the best. There is always room to make it better. But the trick lies in identifying what works best for now. Be agile in determining the best. I started by applying the Rule of 3. On the way to work, I decide on the three things I want to get done for the day. I restricted myself to one day only. I get distracted if I start thinking too far ahead. For the first week or so, I had trouble identifying the three best things for a day. I would either achieve it in the first hour of work or wouldn’t be able to complete even 1 out of the 3. For example, I wanted to complete a module that would have been possible had it not been for a CR [change request] flowing in. Now, it would take me more than 2 days to finish it. My plan for the day went down the tube. Slowly, I began to realize that I had to be more granular. The granularity had to be such that it was independent enough to be completed in isolation and at the same time wasn’t too small a puzzle to solve. For example, “complete and check-in functionality ABC in module XYZ”. This way I’m assured of completing the three activities I want to perform. Also, I can add more if time permits. The next most important pattern was the Timeboxing a week. In other words, scheduling results for a week. Its a pretty simple yet strong pattern. Again, I misunderstood its importance when I started off. I used it more like a calendar. A reminder of bucket lists of sorts. Although it helps, there is something more that this pattern offers. JD was kind enough to point it out to me. He said to think of it like a strengths and weaknesses chart. It triggered a new way of thinking in me. I was now also looking at a week gone by and identifying times of the day, or days of the week where I was strong or weak, and displayed efficiency vs. laziness. And if this behavior was repetitive, odds are you have just plotted a pattern map. Ultimately this chart helps you make better use of your “Best” time, and look to improve upon your “Idle” time. Complementing the pattern above is the Mindsets pattern. JD uses the term switching hats or changing personas. This basically allows you to maximize the returns on “Idle” time by using them effectively in other ways. For example, I would be annoyed when someone disturbed me with something really stupid when I was doing great work. I would lose 10 minutes in the conversation and another 20 cursing the moron who started it off. After using the Mindsets pattern, I now use the 20 minutes of previously wasted time to walk out of my cubicle and stretch and relax. What it has allowed me to do is to concentrate on my exercise rather than the worthless discussion. Also, both my mind and body get a mini-refreshment. 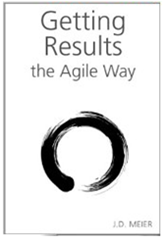 I began to admire this [Agile Results] process because it was so flexible that I could take, leave or modify certain steps so that they fit my profile better. The goal is to understand the essence of the process and modify it to one’s needs. I was pretty satisfied with the results and decided to do a trial run for life as well. A week later, the results came. It was a disaster. The worst part was when I couldn’t figure out why it failed. I thought I must be doing something wrong and worked out the whole thing again. Another week went by and it was still not working. After giving it some thought and asking the right set of questions, I realized one fundamental part that I completely ignored in the application of this process to life – and that is setting minimum and maximum time to activities right from the most granular to the complete. Now, I re-did my strategy of application. In two weeks time I could see improvement. It was far from the final outcome. But bottom line, it had started to work. Now, it is unto me to make it successful. Like they say, success or failure lies in not what you have but how you apply what you have. A very important by-product of this process is quick feedback. You get to know if you are on-track or tangential almost immediately. You can alter the course of your activities midway so long as you understand what you are doing and targeting. This is one of the very few processes that works its way backward, i.e. you look at the end and work your way back. This means you have a vision for what you want to achieve even before you start. This is a very positive way to look at things. The problem with thinking the other way is that my mind will give up very soon. It [Agile Results] is designed to choose the most optimal Traveling Salesman Problem (TSP) algorithm. And if the time to achieve is long, it will deem it unimportant and a waste of my time. In summary, this process has not turned my life upside down in terms of effectiveness and efficiency. But it has paved a path. Adopting it has not been easy at all, at least for me. But the ROI has been well worth it so far. There’s no denying that it will only improve as time goes by and I continue to keep doing things the right way. If there is one thing I have to tell others about this process, it is that do not follow it like a horse. It is a guide, a mentor. Like my mother always tells me, God will help you get you good grades in your exam only if you prepare well for it and put all your energy into it. You cannot expect him to perform miracles out of nothing. Same goes to this process as well. Put your best foot forward and the rest will follow.